On days like today, I decide to hang out the laundry even though there are grey clouds in the sky, knowing that laundry brings rain, knowing that we need rain for the fields and our newly-planted grass. 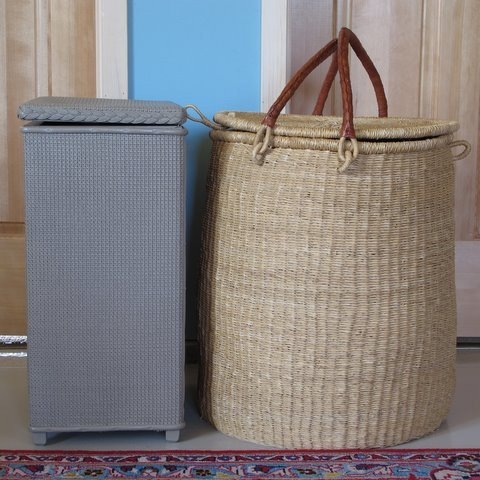 On days like today, I pause to admire my laundry hampers—one, made in Africa of elephant grass and goat hide, a wedding present from my sister-in-law. The other, wicker repainted to match the girls’ room, was their “Daddy’s when he was ‘iddle’,” as Ruth likes to say. 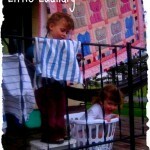 On days like today, I don’t mind the little helping hands that get laundry out of the basket faster than I can hang it. 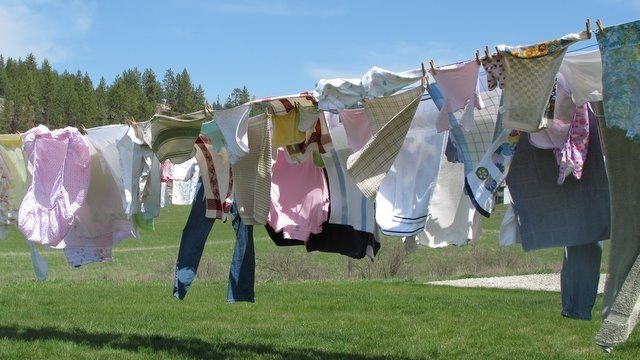 On days like today, I delight in the chill of the breeze as I hang out the clothes, savoring every bit of the warmth brought by the rays of the sun. 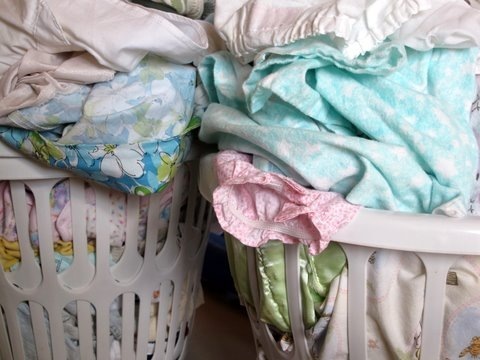 On days like today, I use more clothespins than usual since the wind is proving better at eliminating wrinkles than any iron ever did. 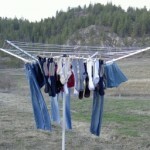 On days like today, I run out of clothes pins and line before I get all five loads of laundry hung out to dry. 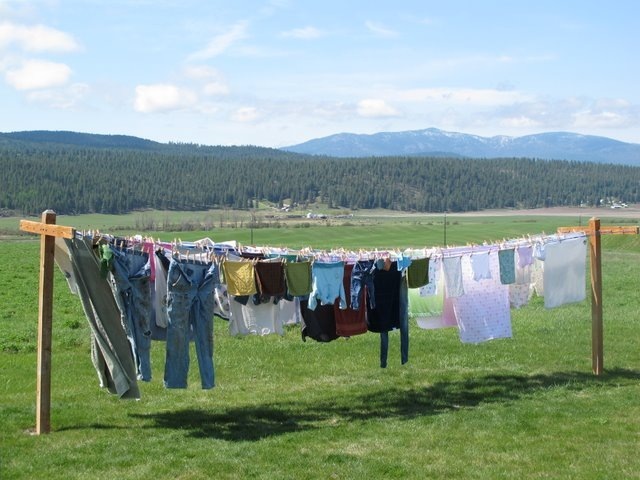 On days like today, warm memories come calling, of all the friends and relatives from near and far that have helped me hang out clothes on this very clothes line. 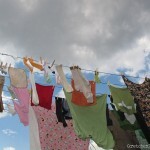 On days like today, I don’t even try to fold the laundry as I take it down, the wind would so quickly undo my efforts. On days like today, I find bath towels and Carhartts piled on the grass despite all the clothes pins I used. 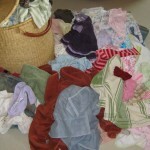 On days like today, I decide that I have enough laundry to do without adding cloth diapers to the mix. 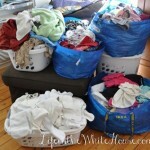 On days like today, I doubt that I’ll get all the laundry folded and put away before an other outfit is soiled. But on days like today, each little outfit, pink blanket, and pair of heavy working pants makes my heart overflow with love and happiness. 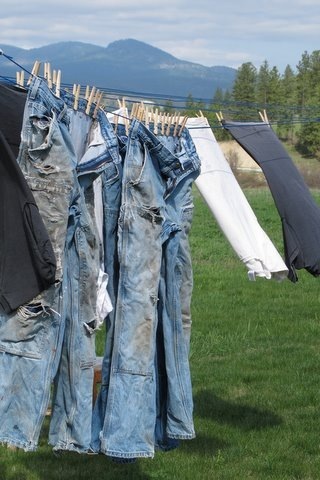 On days like today, I love doing my family’s laundry.